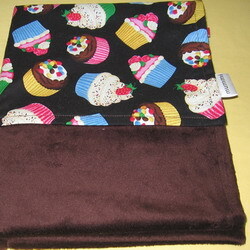 I received a cupcake blanket (brown chenille backing) and a matching designer bib from Eeva at Mummi Quilts. 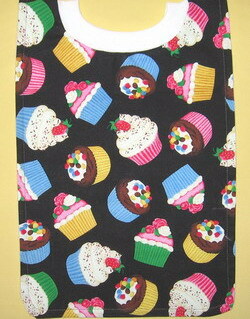 I LOOOVE the cupcake pattern/fabric... it's SO cute and colourful! The blanket was perfect size for "M"... she's a Mini Linus (from Peanuts)... so she's always dragging around a blanket behind her... and she really liked that this one had a link on it that she used as a handle to drag it around and carry it over her shoulder. The link is for hooking it on to the stroller...but whatever works for her right? LOL. The chenille backing is so soft... "M" kept rubbing it on her face and saying "ooooOooo"...lol. Between that and trying to cover up the dog to snuggle with her... it was an eventful night. The blanket is really well made... and they have a TON of patterns to choose from... plus they're really funky.. so I had a blast looking through their site. The bib was probably one of the best bibs I've seen in a long time... it's seen here in the picture. This is awesome! It's nice and long.. totally cute and there are no velcro...snaps... ties.. nothing! It is made like a t-shirt so it has a hole in it... and it pulls over their head. The neck is ribbed and fits over M's big melon... so she had no problem wearing it...and liked that she can take it on and off.... I liked that it covered her whole shirt... so no more big messes to clean up. Unfortunately for the cat... he ended up wearing it during "play time" tonight... man.... she just loves our pets... and they tolerate her. He did however look really cute in it too! LOL! Personalized Mini ribbon loop blanket .....Princess apron..... Changing mat....Organic pants... they even do personalized embroidery! Huge thanks to Eeva for sending me out some of her awesome products! I just love the pattern and "M" loves both of the products! Everyone needs to go check out the website... I love that you can personalize everything!